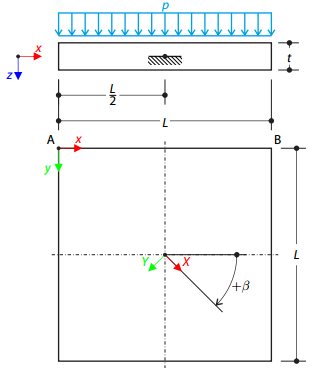 Determination of the maximum displacement, in-plane stresses and stress ratios of a simply-supported double-pane glass plate with a foil between both glass panes subjected to a uniform pressure. A sandwich cantilever consists of three layers (the core and two faces). It is fixed on the left end and loaded by the concentrated force on the right end. 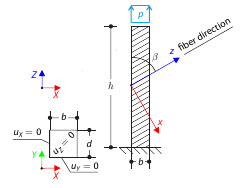 A cantilever with fibers, which don't run in direction of the beam axis, from a square cross‑section with a tensile pressure. Calculation of the maximum deflection.